It was a difficult site - extremely steep and shady with precipitous drop-offs - not the kind of space you think of when you set out to make a garden. But Dan Magill, the second winningest tennis coach in NCAA history, founder of the Bulldog Clubs which helped popularize and support the University of Georgia's sports teams, journalist, author and creator of the Dan Magill Tennis Complex and a University of Georgia legend, took his back property and turned it into an enchanted forest. Preserving the hardwoods and native plants like buckeyes and dogwoods that were already there, Dan and his wife Rosemary added thousands of flowering shrubs, trees, perennials, ground covers and bulbs along paths and steps that were dug from the hills and led to a creek at the bottom of the property. I can imagine that his children and grandchildren have loved playing in these woods; I know when I went there, it was such fun to explore each trail and look at the treasures popping up everywhere. Once the woods were cleared of undesirable undergrowth (a prolonged and daunting task), Dan was able to plug in shade-loving plants like hellebores and hostas. At the bottom of the photograph, which is actually the top-most part of the garden, Dan planted perennials like Japanese roof iris, which can tolerate shade. The forest floor is splashed with yellow wood poppies, and shrubs like hydrangeas provide blooms from summer through autumn. Dan and Rosemary were featured in an episode of A Gardener's Diary on HGTV. There was so much to see that we weren't able to cover it all. The highlight for me was the novelty of walking down a true primrose path. All up and down the steps, Dan had, over the years, continued dividing the yellow primrose, Primula veris, until he had enough to line the paths that go through the woods. You can see the flowers in this photograph in front of the variegated hostas at the base of the tree on the right. In other sections of the woods are large drifts of azaleas, and along the path that follows the creek are thousands of wood hyacinths and other bulbs. On one side of the house at street level, Dan planted grape arbors and grew muscadines and scuppernongs in a grassy, sunny area. An expert on native azaleas, the renowned coach amassed an extensive collection, part of which he donated to the tennis center that bears his name. He also swapped plants with Michael A. Dirr, woody plant guru, and perennial plant authority Allan Armitage, both University of Georgia colleagues. 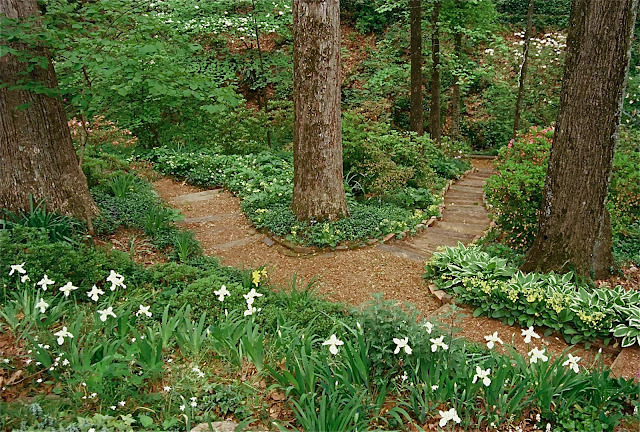 This garden contains great ideas for people with woods and for people with steep terrain. 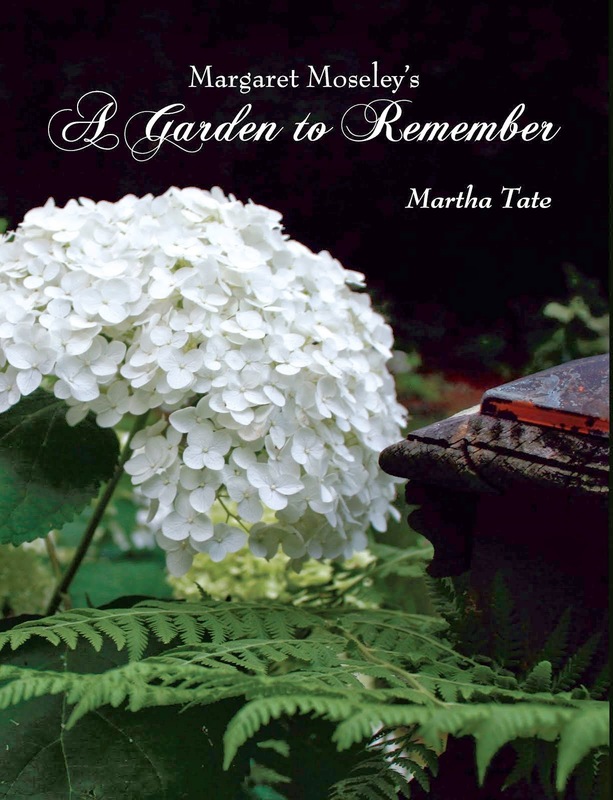 Terracing has been the key, according to his daughter Sharon Brown, who says that she and her brother and sister all developed a love of gardening. As picturesque as the woodland is, though, Dan has admitted that this is not a low maintenance situation. Twigs and leaves are constantly falling onto the paths and invasive plants are forever getting out of hand. Now 91, Dan still enjoys going out into the garden and discovering what has come into bloom that day. For someone who contributed so much to the University of Georgia, it is amazing that he was able to accomplish so much in what little spare time he had. But as his daughter Sharon said, "He didn't play golf or have other hobbies. Gardening has been a passion. He's loved every minute of it." Thank you for introducing me to Primula veris a plant I have yet to try. The rabbits in my woodland garden eat most every perennial and bulb so I am amazed at the variety this garden is able to have. Thanks again for the inspiration.